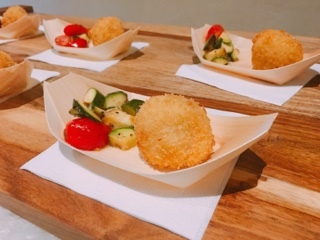 On weekends in May, Niagara-on-the-Lake is getting tastier as they host their annual Sip & Sizzle event. Twenty four wineries across the region offer a signature grilled dish with wine pairing. 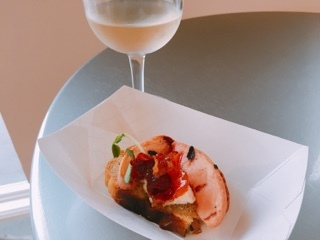 Purchase their wine pass ($54.24) or designated driver’s version that includes a non-alcoholic drink ($31.64) and you’re entitled to a taste of food and drink at each of the participating wineries. With no one wanting to be a designated driver (why miss out on the fun? ), my husband and I solicited the services of a local Niagara transportation company to drive us around for a day. We ended up at ten wineries and certainly got our fill of food and drinks. 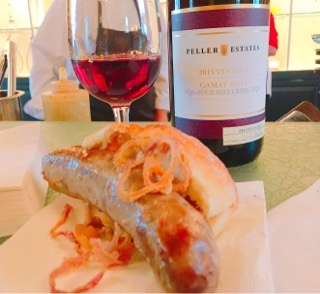 Since Peller Estates was one of the first stops, we were spoiled by the full-sized wild boar sausage – you’re not leaving hungry. The gaminess of the wild boar was mellowed with grainy maple Dijon mustard and the salty crispy shallots were an excellent addition. 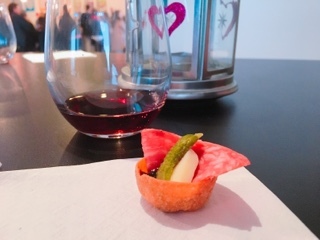 With an equally generous pour of the 2015 Private Reserve Gamay Noir ($19.95), which pairs nicely with the meatiness of the dish, we could have stayed at the winery longer if they had tables to lounge in. Two Sisters also featured a sizeable cod potato fritter with their 2016 Sauvignon Blanc ($34). 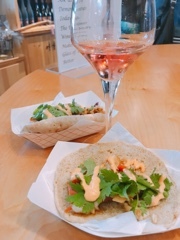 Both the crisp citrusy wine and salty warm fritter were good on their own, but together the wine’s acidity was a tad sharp and caused an almost bitter fishiness to occur. 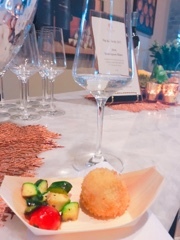 To be fair, the wine did go better with the grilled zucchini, tomato and basil salad – so I’d suggest having the wine and salad first, leaving the cod fritter by itself to end. On the other hand, Château des Charmes had the most optimal pairing, in my opinion. Their 2016 Sauvignon Blanc ($14.95) was not quite as tart and mellow in a refreshing way. 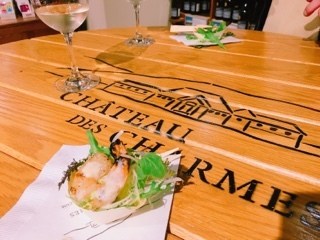 The creaminess of the citrus aioli on the cold sweet grilled shrimp and the strong herbs in the shoot and sprout salad went nicely with the light wine. The participating wineries are a diverse mix: from the massive well known Jackson-Triggs to the new Small Talk there’s vineyards to discover whether you’re a beginner to the region or visited in the past. 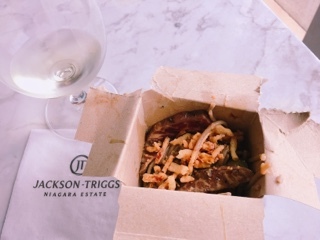 For larger groups, Jackson-Triggs is definitely a good choice as the brightly lit tasting room holds long communal tables where guests can sit and talk. Also, having three people at the station helped ensure you received a glass of their 2016 Grand Reserve Riesling ($18.95) and takeout container of the beef tataki with soba noodles in no time. It’s hard to describe, but I found their wine sweet without feeling sugary and matched the teriyaki soy used on the cold lightly seared beef. The soba was also a good choice and would have been even better if the noodle weren’t overcooked – luckily there were plenty of vegetables to keep it crunchy. Despite having been on a handful of professionally and self-led tours, there were still wineries I visited for the first time including Two Sisters, Rancourt, and Small Talk. Although I don’t agree that the 2013 Small Talk “Goodnight” Cabernet Sauvignon-Merlot ($14.95) would be a good Netflix and pizza drink – the tomato sauce would likely be too acidic for the oaky wine – the winery did nail their pairing. The charcuterie cup was small but mighty in terms of flavours – the crunchy cracker filled with sweet grape jelly, a gherkin, salami and cheese. Yum, I could have polished through at least four of these. 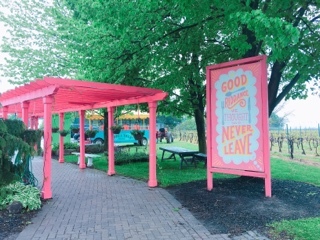 For children, Small Talk’s winery must look like storybook wonderland with the Dr. Seuss like tasting room, pink archway, and bright tram parked by the vineyard. For adults, the wine and cider makes all visits magical. Rancourt’s friendliness is what won me over – that and their warm braised BBQ chicken wing really hit the spot. 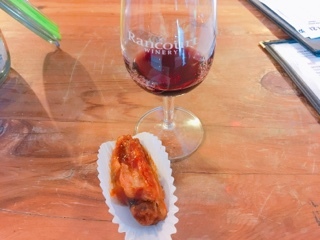 Normally, I wouldn’t have thought to pair saucy chicken wings with wine, but their 2013 Signature Cabernet Merlot Blend Noble Rouge ($14.80) really holds up against the stronger sauce – oh and make sure to take a whiff of it before sipping as it has such a lovely essence. Pondview’s 2016 Carnet Franc Rosé ($16.95) also had an awesome aroma … the wine exudes a strawberry essence. Their Asian slaw dog, although nowhere near the size of Peller’s sausage, was still a sizeable bite, with half a chicken dog topped with a crunchy hoisin lime slaw. Don’t pick off the large pieces of cilantro, it goes really well with everything – who would have thought to use cilantro on hot dogs? I even discovered something new while making return visits given the Sip and Sizzle tastings were often held in areas separated from the traditional tasting rooms. The best location goes to Ravine Vineyards: guests head downstairs to cellar’s private dining area where curing meats hang in a climate controlled room and barrels filled with aging wine line the walls. 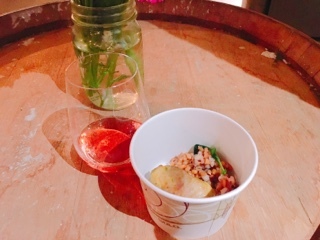 Ravine’s 2015 Cabernet Rosé ($22) leans more towards the red front, but is light enough to still go well with the nutty grain salad. The nugget of harissa grilled chicken thigh could be spicier, but the hot chicken and cold salad was a nice combination. I overhead it’s a special menu item you can’t even get at their restaurant. 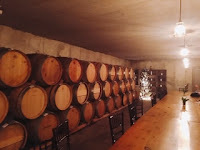 Similarly, a return visit led me to the upstairs tasting room of Pillitteri Estates, which overlooks their vineywards. Their 2015 Debbie Travis Pinot Grigio ($15.95) was a tad sweet for my taste, but was appropriately paired with a caramelized grilled peach and burrata crostini. 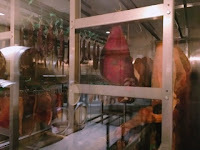 The piece of candied prosciutto was an excellent addition adding a slight saltiness to the bite. 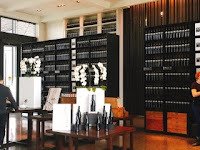 Of all the wineries, Stratus is the one I wish my home could resemble. 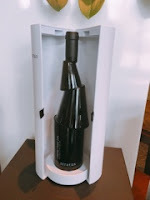 Their sleek architectural design makes me want to turn into a minimalist and they even had a cool special addition bottle on display – sadly this wasn’t the wine being featured at the event. 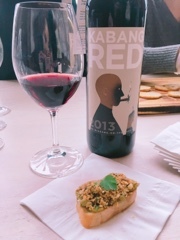 Nonetheless, the 2013 Kabang Red ($24.75) was really good, enough for us to get two bottles, and has a surprising twist. Despite being sweet and fruity to the nose, it tastes rich and oaky without being overpowering. Just watch out, the nut and spice mixture on top of their grilled caponata and salsa verde crostini is messy. I made the mistake of trying to bite through the bread … Kabang, the nuts flew everywhere. Don’t worry, with so many to choose from, you have the entire month to visit. So, break it up into a weekend or even a handful each week … although wouldn’t it be fun to try to fit in 24 tastings all in one day? Disclaimer: The Sip and Sizzle passes were provided on a complimentary basis.Rest assured, as noted in my mission statement, I will always provide an honest opinion.